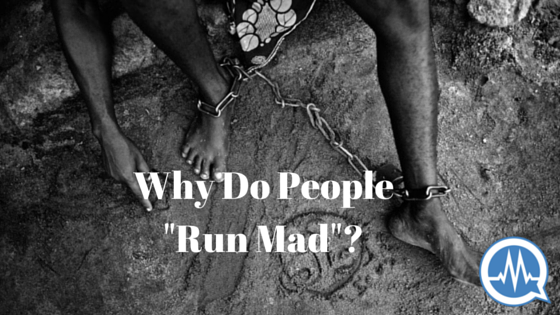 MENTAL ILLNESS: WHY DO PEOPLE BECOME MENTALLY ILL — AND SUDDENLY RUN MAD! Why do people become mentally ill? Behind that question, though, is a deeper one. What most people who ask about the cause of mental illness are really wondering is: How can I prevent it from happening to me or those love? And what they’re thinking is: if I know where it comes from, I can, hopefully, figure out how to prevent it happening to me. Well today’s your lucky day, because I’m about to answer it for you. Be warned though: the answer might not be what you expect! Let’s get rid of the bad news first. You can’t really prevent mental illness! Sorry, but that’s just how it is! But — and this is a very important — that’s not a bad thing, so don’t get so glum already. Cheer up, the good news is coming! No? You want me to explain the bad news first? Okay, okay, I’ll oblige you. It’s just that, to explain it properly, I’ll need to start by explaining a couple other things. So when I say mental illness isn’t really preventable, I’m referring to primary prevention: there’s little or nothing we can do to stop a mental disorder happening. And the reason is that we don’t fully understand the causes, and then there isn’t even a lot we can do with what we do know — the risk factors. We do, however, know a whole lot about how to stop it getting worse when it’s started (secondary prevention), but again, that’s not the focus today. So what are the risk factors of mental illness? Like I said, we don’t fully understand the causes, but it’s not like we don’t know anything at all. What do we know, then? We know the things that increase the risk of developing mental illness. I’ll start with the less important risk factors and move to the more important ones. When someone has a relationship break-up or failed an exam and then becomes mentally ill, the commonest response is that the illness was caused by that problem, whatever it was. But that’s not quite right. A good way to think about it is (like I explained on a post about how mental illness and asthma are similar): the dust or fumes only trigger an asthmatic attack, but the risk for asthma was already present long before that, wasn’t it? It?s the same with mental illness. I’ve often seen situations where someone with a mental illness is believed to have been using drugs (the commonest suspect being cannabis, the active ingredient in Indian hemp, aka igbo). In reality, however, the longstanding controversy over the relationship between cannabis and mental illness (talk for another day) is itself an indication that things aren’t quite that straightforward. For now, the evidence suggests that drugs mostly trigger mental illness in those who were already prone. (Note: who were “prone”, not who had “weak heads”, whatever that means.) That said, many people who develop one mental illness or the other didn’t actually use drugs, and many who’ve used drugs don’t develop mental disorders. This is one of the least important among the less important factors. There is some connection between some personality types and some anxiety and depressive disorders, but not that much. So the common idea of some people having “weak personalities” really is a very misguided one. This is number one on the list of causes. For many mental illnesses, the risk is genetically transmitted: that is what is transmitted is not the illness itself but the possibility of having it, through genes that are often shared by many members of a family. (In practical terms that means you can say the risk of a particular mental health problem runs in a family, but you can’t say mental illness itself does. Of course, keep in mind that every single human being carries one family-related health risk or the other.) So when we say someone is predisposed, we usually mean genetically. 6: Environmental exposure (before birth). Besides genetic predisposition, some people are predisposed to one mental disorder or the other by exposure while in the womb to infections, toxins, alcohol and drugs or other stressors. So, is it all just plain luck then? In a sense, yes. Not completely, because there are other things involved, but mostly, they’re not easy things to actually control. So it’s almost a matter of luck whether or not anyone will have a mental health disorder. Here’s a helpful way to think of it though: it’s kind of like owning a car. You do what you can to take care of it (check your oil, service it regularly), but you still have car insurance because you know anything can still happen, since you’re not in control of how other people drive. In the same way, there are lots of things we can do to maintain great mental and physical health, but they don’t necessarily prevent things like cancer or mental health disorders from happening. I can tell you though, and for free: worrying about it won’t help in the least. So hope for the best, live as fully as you can, and instead of worrying about whether or not you will have a mental illness, focus on helping those around you who actually do! Dr. Ayomide is a medical doctor, mind health consultant and speaker who helps people rise above emotional and relationship challenges to live the productive and fulfilling lives they always longed for. He writes on mind health and mental illness on his website: DocAyomide.com. Follow him on Twitter:@DocAyomide. Book a session with him and step up your mind game for good. 20 SURPRISING FACTS ABOUT DEPRESSION THAT YOU MUST KNOW! 5 MEDICAL PROBLEMS OF CHILD MARRIAGE. HOW TO OVERCOME THE FEAR OF DEATH IN 7 SIMPLE WAYS! PROTECT AND PROVIDE FOR THE FEMALE CHILD!